Three explosions went off near the team bus of Borussia Dortmund, one of Germany's top soccer clubs, as it set off for a Champions League quarterfinal match on Tuesday evening. One of Dortmund's players was injured. 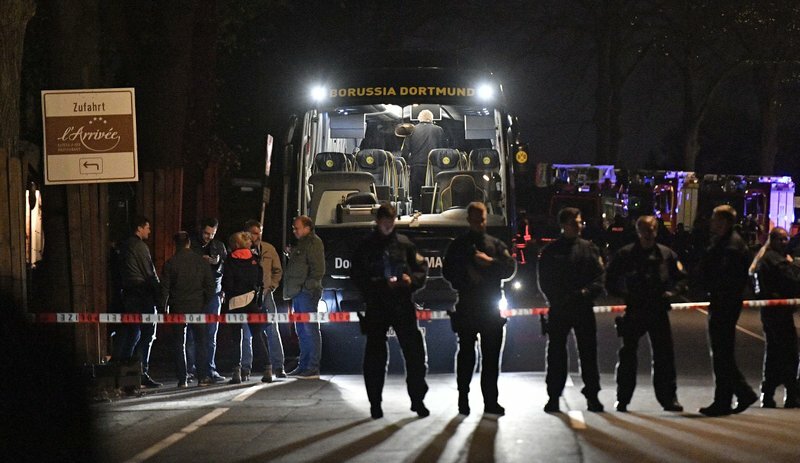 Police said they were working on the assumption that the blasts were directed at the Dortmund team and caused by "serious explosive devices," which may have been hidden in a hedge near a car park. The explosions happened as the team was departing its hotel for a first-leg match against Monaco. The game was called off shortly before kickoff and rescheduled for Wednesday. A letter claiming responsibility was found near the site of the blasts, prosecutor Sandra Luecke told a late evening news conference. She said investigators are examining the authenticity of what was written in the letter, but wouldn't reveal more about its contents, citing the ongoing investigation. The case is being investigated as attempted homicide, Luecke said. "We had to assume, and assumed right from the start, that this was a targeted attack against the team of Borussia Dortmund," Dortmund Police Chief Gregor Lange. Investigators are not excluding any possible angles in their investigation, while the "concrete background" to the blasts remains unclear, he said. There were three explosions near the Dortmund bus as the team left the L'Arrivee Hotel and Spa on the outskirts of the western city of Dortmund for the stadium, around 10 kilometers (6 miles) away, at 7.15 p.m. local time (1715 GMT), police said. A window on the bus was damaged and Spanish defender Marc Bartra was injured. Club spokesman Sascha Fligge said Bartra was operated on late Tuesday for a broken bone in his right wrist and to remove "foreign objects" from his arm. 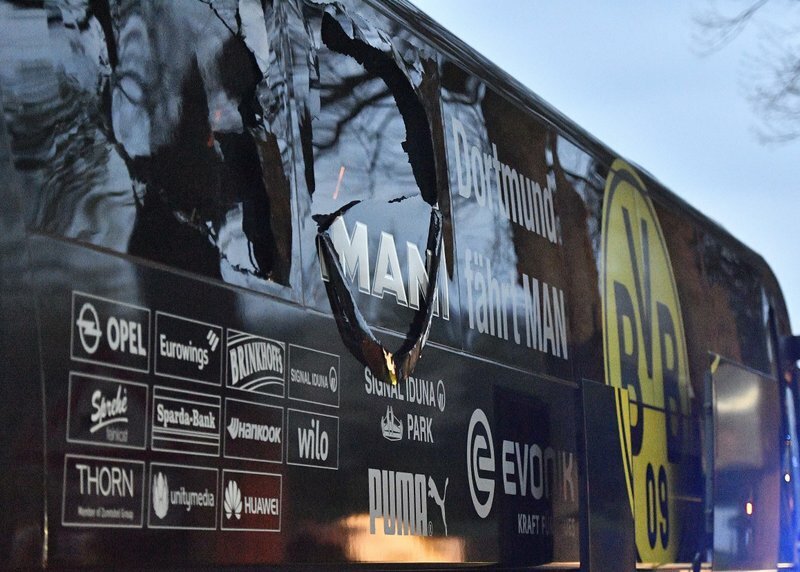 Dortmund goalkeeper Roman Buerki said the team bus had just pulled out of the hotel driveway when an explosion — a "huge bang" — happened and sent glass flying. Buerki, who is from Switzerland, told Swiss daily Blick that he was sitting in the last row of the bus, next to Bartra. Bartra was hit by shards from the broken back window, he added. Players ducked for cover, wondering whether there would be more explosions. "We're all shocked — nobody thought about a football match in the minutes after that," Buerki said. Lange said a further "suspicious object" was found at the scene, but it does not appear to have been another explosive device. Inside the packed stadium, supporters of Monaco, which plays in the French league, chanted "Dortmund, Dortmund" in sympathy for the German side. Dortmund residents, for their part, used social media to offer accommodation to stranded Monaco supporters ahead of their rescheduled match in Europe's premier soccer club competition. "The team is totally shocked, that's clear. It's our task now to digest this somehow because it's only 24 hours before we have to play. That's our job," Dortmund Chief Executive Officer Hans-Joachim Watzke said. Watzke added that there was "no alternative" to rescheduling the match for Wednesday, as Monaco also has to play over the weekend and the return Champions League match is scheduled for next week. "It's a very unfortunate situation, but there was no other way," he said. Stadium spokesman Norbert Dickel informed fans already inside the venue of the cancellation, saying that "there is no reason for panic here at the stadium." Police said fans left the stadium without problems. Police chief Lange made clear that authorities will put heavy security in place for Wednesday's match, though there was no threat to the stadium on Tuesday. "We are preparing for a major operation tomorrow, and we will do everything humanly possible to ensure that the match tomorrow can occur safely," he said. The president of European soccer governing body UEFA, Aleksander Ceferin, said he was "deeply disturbed by the explosions" and that the teams had made the correct call by postponing their match. "The thoughts of every one of us at FIFA are with the people of Dortmund, and the fans of both Borussia Dortmund and Monaco following today's troubling events," said world governing body FIFA's president, Gianni Infantino. He wished Bartra a "speedy recovery" and condemned the explosions. Germany has seen matches postponed over security concerns before. In November 2015, Germany's international soccer friendly against the Netherlands in Hannover was canceled just before kickoff because police feared an explosive device might be detonated at the stadium. It came days after devices were detonated outside the Stade de France in Paris as France was playing Germany as part of a coordinated attack on the French capital.